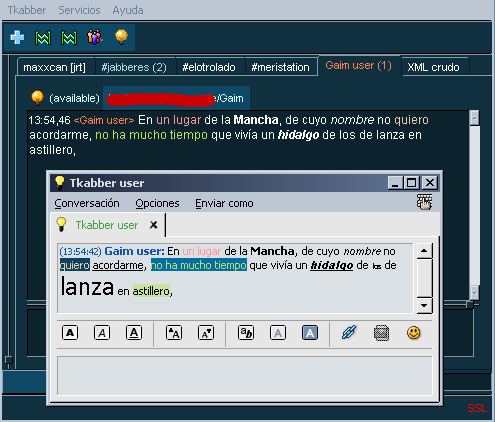 Tkabber has partial support to render XHTML messages as described in the experimental JEP-0071: XHTML-IM. In this test I used Tkabber CVS 2004-06-24 and Gaim 0.79. Warning: please don't forget that JEP-0071: XHTML-IM is still experimental. The publication as a Jabber Enhancement Proposal does not imply acceptance or approval of this proposal by the Jabber Software Foundation. The Jabber Software Foundation recommends its implementation only for exploratory purposes. In this test I'll only check font color, background, size and typeface. Note: the message is a citation from the novel 'Don Quijote de la Mancha' (english: Don Quixote) by spanish writer Miguel de Cervantes, first published in 1605. This novel is often refered as the best work of fiction, ever. Of course, the text is freely available for the mankind enjoyment. 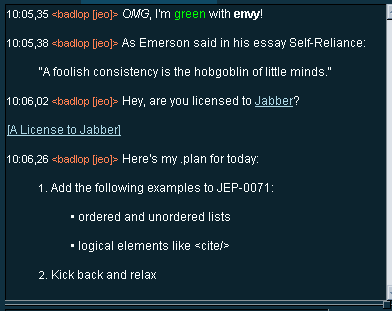 On the following screenshot you can see how Tkabber renders four example messages available in JEP-0071.